I've heard it said that "ignorance is bliss." I'm not so sure about that, for in my experience, I've found that ignorance can get you killed. Or worse, ignorance can make you stupid. Sometimes I truly wish I were content to just coast along on what I've already learned and not be bothered with having to check in "just one more time." On my last trip out visiting churches in 1985, the Lord gave me the word to "take everything you believe and lay it out on the table and see why you believe it." I shared that almost everywhere we stopped during that fateful time. I do not know if anyone besides myself was impacted by the enormity of that task, nor of the possible consequences. Wasn't that what they always did? It would seem so; but it also appears that they only searched to prove what they already knew, and Jesus told them they didn't know what they should. I have spent the major portion of my adult life searching the scriptures, and about the only thing I've learned is how much I don't know. For years, decades actually, I have held a notion firmly rooted in the logic of my mind, but devoid of scriptural backing. A few nights ago, the scriptural backing came in the form of correction—I had been telling myself something that didn't stack up. I've told many people of my theory, and I believe there are some who, as a result, share my misguided belief. From a purely rational position, I have long held that Jesus did what He did on the earth as a man, not God. Logic demands that there is no way He could be 100% God and 100% man, but that is the teaching of the majority, or, the orthodox position (if you will). Theologians refer to this as the "hypostatic union." I also argued that if He did His miracles as God, then I don't have a chance of measuring up to the pattern He set for me. Of course, those verses were penned to spur us to greater love, humility and service, not to create a theological debate. But, theological debate is an interesting distraction to help us avoid those demands of love, humility and service. Some translations take "made himself of no reputation" and render it "emptied himself," which is the translation of the word κενόω (kenoo). The false doctrine to which I adhered is called the kenosis theory—that Jesus emptied Himself, or laid aside all His attributes as God in order to become man. I understand how that flies in the face of His divinity, but that was easily reconciled by a simple denial—or so I thought. Well, if all fulness is to dwell in Jesus, how could He be less than that? For in him dwells all the fulness of the Godhead bodily. It's that "bodily" part that did me in and put me on my face before the Lord in repentance. How could I possibly fit some sort of changeability into that? 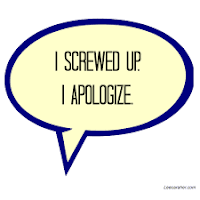 Therefore, it is clear to me (now) that I screwed up. I held and taught something that I believed to be true, but clearly was not. To any and all of those who may have been affected by this, I offer my sincere apology and ask that you forgive me for any harm that may have resulted from this deception.